With this strain we offer a connoisseur quality smoke at an amazing price. Chill-OM is also a good beginner strain, delivering a satisfying yield with just basic plant care. It has all the benefits of hybrid vigour, nutrient efficiency, and the versatility of growing well under many different cultivation methods. Best results can be expected under a good light source such as HPS lamps, because the sativa genetics in this strain do require sufficient light intensity for abundant flowering and THC production. Chill-OM grows thick stems and has well-defined, yet space saving, branching to provide excellent cuttings. It is also perfect for sea of green or close planting. This strain shows some phenotype variation that is mainly expressed in plant height during flowering. The tallest females will be the best choice as mother plants if you are aiming for maximum yield. They can also produce bumper crops outdoor - with long central colas that resemble a giant bong. Shorter females are excellent for small spaces, or for the balcony in regions with warm temperate or hot summers. Of course, you can easily modify height by pruning down a tall plant, or raising a shorter one with an upturned container. If you are growing Chill-OM indoor from seed you should not exceed the 4 week vegetative period in soil. This will prevent issues with the unpruned plants of the taller pheno since growth is fast and strong. The max. height of a tall female under these conditions will be around 150 cm/4.9 feet under 400-600W HPS. Pest and mould resistance is good and outdoor plants have survival capabilities against harsher weather from wind or storms due to their robustness. 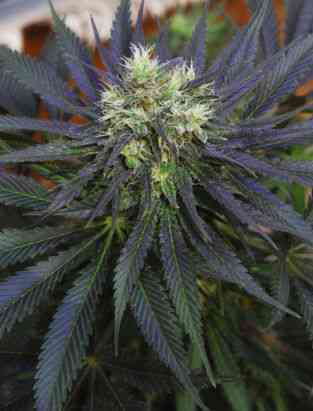 Chill-OM easily compensates the lack of uniformity in plant height with it's exceptional top-grade marijuana. The buds are dense and have great 'bag appeal'. When crushed in a grinder, an interesting aromatic blend of frankincense and sage arises from the sticky buds. The smoke is smooth and rich, with a minty aftertaste on the exhale that leaves a pleasant freshness on the tongue like peppermint gum. Chill-OM strikes a perfect balance between potency and everyday enjoyability. After a quick cerebral onset it triggers the feel-good physical sensations. The high then reaches an even and motivating stone that is pleasantly relaxing, yet leaves you with enough energy for socialising or doing something creative. This marijuana can be fun for gaming, hanging out with friends. or watching a good movie. It's vibe is sensual and playful, enhancing the pleasure in whatever you are doing. As the name suggests, Chill-OM is perfect for laid-back hours and leaves a state of wellbeing behind. Have fun and chill out! Medical use: Broad spectrum use; good potential against lethargy and depression. Yield (dry weight): 300-500 gr/m2; 600-1000 gr. per plant outdoor in the ground.